We feature the Mohawk® line of carpets, so you can always expect the best of the carpeting business. 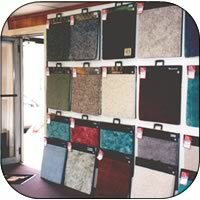 We carry an extensive line of saxony and berber carpets, with a wide variety of both colors and styles to choose from. We also offer Kid-Proof Carpets, which have extended warranties and features. For your vinyl flooring needs, choose from Tarkett® and Congoleum® flooring. Choose from over 700 different styles, ensuring the best selection to match your lifestyle. We also install vinyl tile flooring, guaranteeing that the basement refinishing job gets that professional treatment. 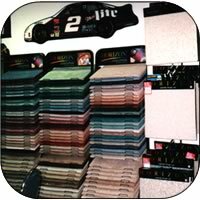 If you are a Nascar® fan, we have several different styles of rugs for your car, RV or home. Please contact us and we will be pleased to send you a catalog.